Two volumes. Second state of portrait as usual. Two volumes. Second state of portrait as almost always. Contemporary calf rebacked at an early date, endpapers replaced. Some browning and rubbing. A very good set. FIRST EDITION. This is a handsome set of Teerink’s A edition, the true first edition. As Sir William Temple’s secretary at Moor Park, the young Swift had access to many travel accounts in Temple’s library. A frequent reader of such books during his formative years, Swift began working in 1714 on his own fictional account of the travels of Martin Scriblerus. The success of Robinson Crusoe (1719) helped spur on the writing of the book, a satire not only of travel narratives but of many aspects of eighteenth-century life including politics, science, commerce, and society. By the 1720s that work had become Gulliver’s Travels. 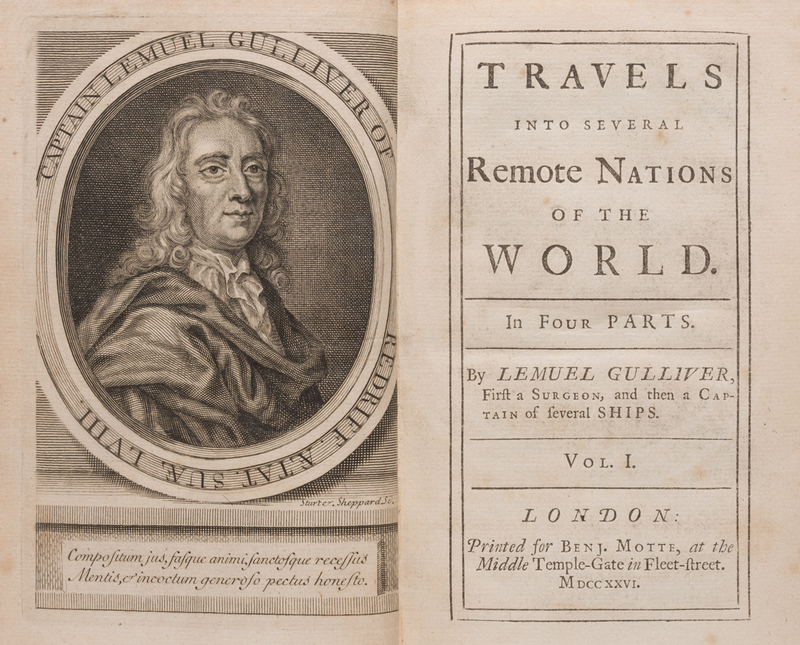 In March 1726 Swift came to England for the first time since 1714, bringing the manuscript of Gulliver’s Travels. “To preserve his anonymity, Swift dealt with Motte by post and through intermediaries. … It has always been assumed that political prudence was the main reason for Swift’s so carefully preserving the secret of his authorship. Certainly Swift enjoyed the thought (whether real or illusion) of writing dangerously” (Lock, “The Text of Gulliver’s Travels”). The author returned to Dublin even before the parcel had been delivered to the publisher. Although it was rumored that Swift was the author, he maintained the fiction that he knew nothing of the authorship in his conversation and correspondence. Motte hurried the book into print, using five printers who took different sections of the text. The initial printing (Teerink A) sold out within one week, and two additional editions (AA and B) soon followed. Gulliver’s Travels was an immediate success, and the book has remained one of the enduring classics of English literature. Thomas Gay wrote that “from the highest to the lowest it is universally read, from the Cabinet Council to the Nursery.” The influence of Gulliver’s Travels has been vast. The terms Lilliputian, Brobdingnagian, and Yahoo have entered the language. The book inspired countless sequels, adaptations, parodies, and imitations worldwide in print, comics, cartoons, television, stage, and film. The wildly imaginative book became a source of inspiration for authors from Voltaire to Orwell, and it is one of the few works of fiction of its time that is still widely read for pleasure. Teerink 28 (A edition). Rothschild 2104-6. Printing and the Mind of Man 289. Grolier/English 42.